Nestlé Waters’ Adaora Ugokwe, who handles activations for Perrier and S.Pellegrino, has some advice for event marketers looking to pull off a successful launch event. And she should know. The Perrier Flavor Studio, a pop-up event held in New York City July 12-16 to increase awareness for Perrier’s sparkling flavors and to launch two new ones—strawberry and watermelon—brought in more than 5,600 guests over five days and garnered more than 2,100 original Instagram posts and shares of its #PerrierFlavors hashtag. 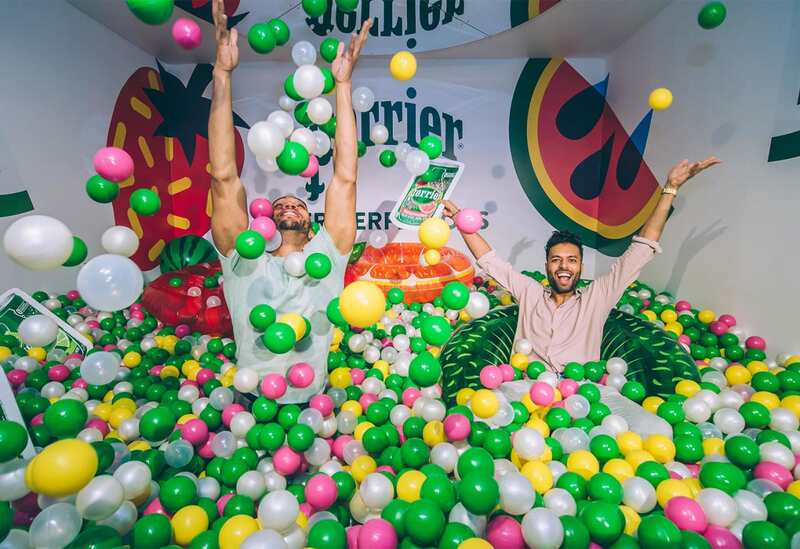 The brand sampled the full range of its flavors on their own and in signature “mocktail” recipes and served close to 10,000 Perrier sparkling flavor beverages. Achieving stellar results such as those is no easy task. We asked Ugokwe about what goes into successful launch events. “In my experience, with the brands I work on, it’s really making sure we are aligned with the brand and building in little surprise elements that are true to the brand, something that is exciting and dynamic and shareworthy for the consumer. Then, leveraging these opportunities to launch the event,” she said. Here, we take a look at each of those elements and how they played out both off and online at the Perrier Flavor Studio. 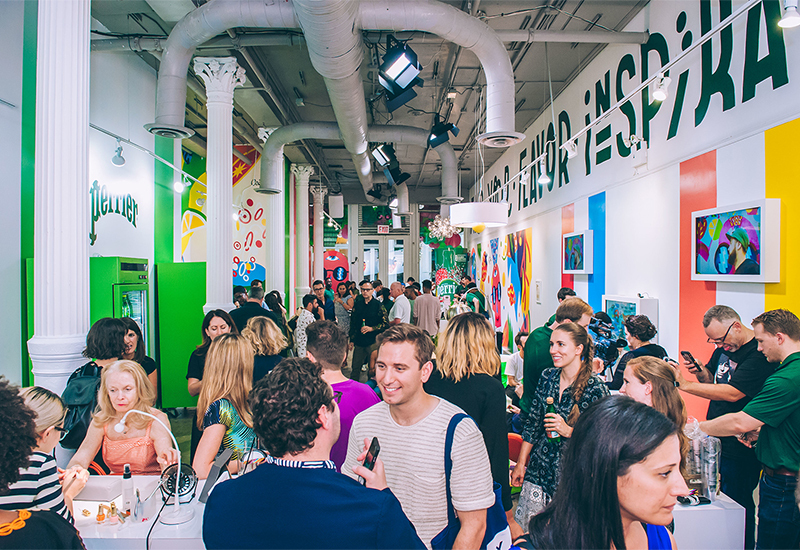 The Perrier Flavor Studio brought in more than 5,600 guests over five days. “We wanted to make sure consumers had an opportunity to get a sense of who the brand is, try the exciting new flavors and then have a moment, have fun. Perrier is a really fun brand, and we wanted to bring all these things to life for them,” Ugokwe says. To achieve this, in addition to the Perrier mocktail bar, the event featured original artwork by its partner artist AKACORLEONE, who has created many of Perrier’s designs that appear digitally and out of home in New York and L.A. and invited guests to find their own flavor inspiration through interactive elements. Attendees could tap into their own creativity at an interactive art wall where they could make his designs into their own, then have them printed onto a bag that they could take home. 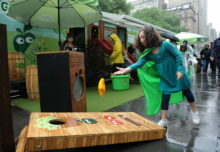 The fun side of the brand came to life in the form of a “bubble pit” inspired by the brand’s signature green hue and other colorful flavors. Attendees took a plunge then snapped a photo with their phone for sharing on social media. “People saw it on social media and came into the pop-up just to get into the ball pit. It was a highlight of the week, for sure,” Ugokwe says. 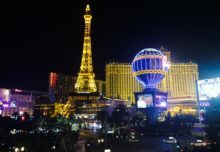 A social media vending machine and tunes by DJ Hannah Bronfman each evening added to the fun, along with custom treats such as ice cream from New York City-based Big Gay Ice Cream on National Ice Cream Day and macarons from Dana’s Bakery on Bastille Day. While ample social media opportunities were threaded throughout the experience, a media preview event held the night before the event ensured a social media splash in InStyle, Us Weekly, Delish.com, Eater and Time Out. More than 150 social influencers, media and VIP partners attended the preview, which included treats from Big Gay Ice Cream and Dana’s Bakery and fingernail art by Vanity Projects. “There was so much buzz, people were coming in saying they had seen it online, asking how long the pop-up would be open. Having a preview day helps draw the buzz and the longevity of the program, so that consumers know it’s not just a one-two thing. It’s going to be for a few days with multiple options to come and check it out,” Ugokwe says. Agency: The Michael Alan Group, New York City.